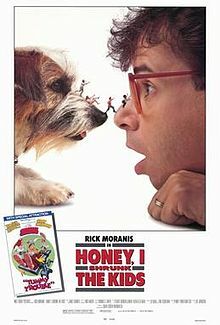 Continuing the series, my third science fiction movie was ‘Honey I shrunk those Kids”, the 1989 Walt Disney Film directed by Joe Joshnston. I got to see this movie at school – we had a weekly hour called Audi Visual instruction Class, where we were shown movies on television. I watched this movie in two sessions of this class and was very fascinated by the concept. The story is about four kids and a scientific invention that can shrink objects to microscopic size. The inventor is the father of two of the kids. The four kids accidentally get shrunk by this device and find themselves dealing with garden insects that are now gigantic in size compared to them. The story follows their adventures in the garden which is like a big fantasy land given their current size, making alliances with friendlier insects, fighting off hostile insects and making use of their ingenuity to return to their home and establish communication with the scientist. This is a theme in fantasy I would call the interesting point of view – the world here is seen from the point of view of insect sized creatures. This is actually a story that would have easily been science fiction or fantasy. As science fiction, the science of it is a bit of stretch. I am not sure if there is any scientific way to make objects smaller and bigger like the cake and mushroom in Alice in Wonderland. Also it is not certain if a complex organism like the human with so many organs will be able to exist at such a microscopic size – mostly microorganisms are biologically much simpler. It can possibly be called science fiction only for the reason that the transformation of size is accomplished by an equipment that looks scientific rather than through something magical. In many of the cases this is all the difference between science fiction and fantasy. The main theme in this movie is a reversal of power equations. Normally insects are small and humans big. Here we have a reversal – the humans are small and the insect bigger. The other theme one can possibly think of is the exploration of the fascinating world that exists in as mundane a place as the lawn in front of one’s house. Just a change in size transforms it into a dangerous jungle with wild creatures. So one gets the typical fantasy element of exploration and adventure. The other key elements are slapstick comedy and development of relationship between the characters. We have the usual family sentiment, romance, people who do not get along initially forced to work together as a team resulting in them eventually becoming friends. Then we have the bond between a human and a non-human actor – in this case an ant. The main conflict that keep the viewer interested is the escape from all the dangers of the lawn and restoration to normal size working against the various obstacles. Overall I found it a fun watch and possibly would think it worthwhile to watch it again even now for the taut action, comedy and the innovative idea. No wonder the movie has been so popular that is has spawned not one but two sequels. However I have not had the opportunity to watch the sequels. True that - all that seems to separate SF and Fantasy in movies is the gadgets. Btw, Fantastic Voyage is another movie based on shrinking human beings; and Asimov wrote 2 books based on it. He specifically mentions that Fantastic Voyage - 2 was written because he was not satisfied with the science in the movie and, thus, the first book which followed the movie closely. The science of shrinking, as he uses it in Book-2, involves reducing the Planck's constant, and shrinking itself happens only for a time. Haven't read those books. Maybe I will pick it up some time. Its been ages since I read any Asimov books. I've had this belief that there really aren't any 'other worlds", they're all within our world and this movie is kind of supports that :) One of my favorites. And there were sequels? I've been living under a rock!! Even I came to know about the sequels when I was googling for the details I could not recollect. I am a fantasy buff who wants to believe in all kinds of fancy worlds. Yeah. The ant was the real hero of the movie. I had quite enjoyed the movie when I had seen that. I must say I hadn't analysed the story from the perspectives you have brought forth in your fine analysis. I didn't like the sequel though in which they blow up the kids. Thanks Umashankar. I haven't seen the sequels. From what you say seems like they are not worth watching.